Carers Bromley provides support to the people in the London Borough of Bromley who provide care for others who, due to disability, long term illness (mental or physical) or frailty, are unable to cope on their own. Keywords: Carers Bromley Borough Of Adult Care Young Services Disability Frailty Kent Care. two profiles were found for Carersbromley.org.uk in social networks. Among other social networks the website is represented in Facebook and Twitter. The web server used by Carersbromley.org.uk is run by Digital Ocean and located in USA. This web server runs a few other websites, mostly in the english language. 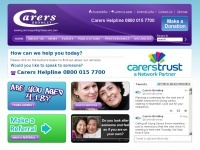 The websites of Carersbromley.org.uk are served by a Nginx server. The content management system Joomla! is used. The HTML pages were created with the latest standard HTML 5. The website does not specify details about the inclusion of its content in search engines. For this reason the content will be included by search engines.